A promotional poster for Netflix’s “On My Block.” Photo courtesy What’s On Netflix. 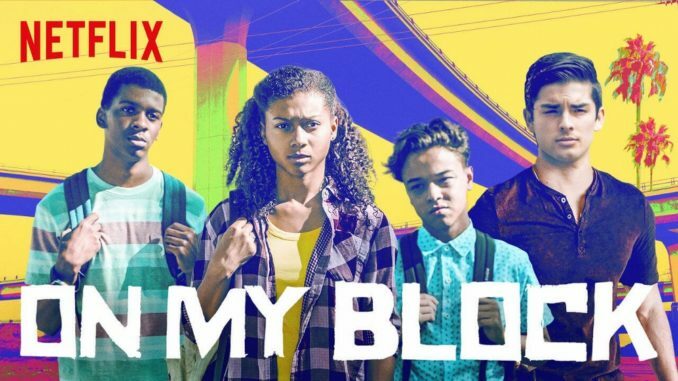 On Friday, March 29 Netflix released the second season of their new original show “On My Block.” The show was created by Lauren Iungerich, Jeremy Haft and Eddie Gonzalez. Monse Finnie played by Sierra Capri, Cesar Diaz played by Diego Tinoco, Jamal Turner played by Brett Gray and Ruben “Ruby” Martinez played by Jason Genao. These four friends have to figure out how to survive living in inner city Los Angeles, which is riddled with gangs, high school and their friendship to each other. The show is introduced to the mildly violent neighborhood during the party where all the friends were trying to guess what caliber of gun was being used as they ran away. The area where the characters live is a battleground for two rival gangs the Santos and Prophets. Cesar wants to live a normal life but he is not able to because he is a legacy of the Santos. His older brother Oscar goes by the nickname Spooky. Season one was released on March 16, 2018 and consisted of ten amazing episodes. The first episode started off during the summer of their freshmen year in high school, they observe a high school party mentally preparing themselves about what they are going to experience in high school. “On My Block” has mini-plots that surrounds the entire show, helping to paint a bigger picture of the series. One of the mini-plots involves hidden treasure. The hidden treasure is called Rol. The cash had come from some of the founders of the Santos. A majority of the characters in the show do not know that the money is real. Jamal believes that money is real. He goes off on an adventure to find the treasure. Money at the end can help with arising problems. Olivia is oblivious that Ruby is attempting to flirt with her. Olivia is distant from the group because she misses her parents who are in Mexico but finds comfort with Monse and the group. Olivia develops deep friendship with Monse and they become girlfriends. Problems arise when Olivia starts a relationship with Cesar. Monse is a brilliant writer, who has a crush on Cesar and is afraid to tell him. She goes to writing camp at the start of the show and Cesar buys her a special notebook so they can stay in contact. They start a secret relationship so it does not interfere with the harmony group. While she is trying to figure out her feelings for Cesar she also trying to find her mother. She creates a fake name to babysit someone who could potentially be her mother in the nearby city of Brentwood. Cesar has a bright future ahead of him, if he can escape from his family’s lifestyle. His brother and father are both members of the Santos gang. He stayed outside of the Santos eyesight until his older brother Spooky got him jumped in and slightly involved in the gangs’ operations. A difficult task for Cesar was to kill a certain member from their rival gang the Prophets. Jamal, Monse and Ruby are all trying to figure out how to get Cesar out of gang life. They all planned that the best way for Cesar was to use the RollerWorld. The season comes to an end with Olivia’s quinceañera. Olivia discovers that Monse has deep feelings for Cesar and then Olivia and Cesar break up. Olivia encourages Monse to confront Cesar about her feelings towards him; they slow dance and kiss. While the celebration is occurring Jamal figures out the riddle to where the money could be hidden after some twists and turns and receiving some help from Ruby’s grandmother. The party is running smoothly, Olivia is shocked that Ruby establish a way for her to communicate with her parents. Out of joy and excitement, Olivia embraces and kisses Ruby. Things turned for the worse when an unwanted guest arrived at the party. The unwanted guest is a member of the Prophet$. This guest fired off two shots which cause two of the characters to fall to the ground. While emergency services are contacted they rush the victims to the hospital. A few moments before the ambulance is rushing the party, Jamal was riding on his bike with a heavy duffel bag. The last few seconds of the episode shows us one of ambulance turning off their sirens. The turning off of the sirens symbolizes that the patient has died. This is a huge cliff hanger because we do not know who died. Season two starts off by answering the question of who died in the ambulance. Then they explore how the characters try to move on with their lives.